As per the recent service tax notifications (Notification No. 21/2015-Service Tax and Notification No. 22/2015-Service Tax), all organizations that offer services covered under the ambit of Service Tax, should charge an “Swachh Bharat Cess” at 0.5% of the service value from November 15th 2015. Housing Societies need to collect and pay service tax at the rate of 14% for all members where the monthly collection is more than Rs. 5,000/- (Refer Jan 2014 Circular on Service Tax on Apartment Associations for more details). Other key aspects of interest are listed below. From Nov 15th, the invoices need to have another line item called “Swachh Bharat Cess” charged at the rate of 0.5% value of the taxable amount. Based on our understanding, Swachh Bharat Cess needs to be charged separately on the invoice, needs to be accounted separately in the books of account and needs to be paid separately under separate accounting code which should be notified separately. Cenvat Credit Rules, 2004 determine if a tax / cess can be claimed as input credit. Howver, there is no amendment in the Cenvat Credit Rules, 2004 regarding Swachh Bharat Cess. In the absence of the same, Swachh Bharat Cess levied by the Housing Society vendors and paid by the Housing society cannot be claimed as input credit. So, at this point in time, this would be extra cash outflow on the society due to Swachh Bharat Cess. What should you do in ApnaComplex to take care of this additional cess on the invoices you raise? If your society is levying Service Tax, identify the best scenario that fits you among the below to know the steps. Scenario 1: If you are using recurring invoice with automatic service tax calculations, you need not do anything. ApnaComplex is enhanced to charge this as a separate line item on the invoices raised after Nov 15th. Scenario 2: If you are using recurring invoice with service tax as a calculated line item, you need add a new charge type with name “Swachh Bharat Cess” and move the same to Taxes accounting head in Chart of Accounts. Post that update your recurring invoice setup to add one more line item with net value equivalent to 0.5% under SB Cess head. Scenario 3: If you are using manual mode, you need add a new charge type with name “Swachh Bharat Cess” and move the same to Taxes accounting head in Chart of Accounts. Now, go to Income->Add charges (or upload charges) with net value equivalent to 0.5% under SB Cess head. In all scenarios, we would always recommend you to check with your accounting firm or auditor to ensure they are on board with your understanding. We are pleased to announce the release of Approval workflow for Bills. Almost all societies have the process of bills submitted by vendors to be approved by one or more committee members before the payment is released to the vendor. With this new feature, accountants will now be able to trigger a approval workflow when ever a new Bill is received. The approvers can approve / reject the bill with comments. A bill can re-submitted for approval with updated data to the approvers. Unless a minimum number of approvers approve the Bill, no one would be able to record payment against that Bill. The approver list is same as PR Approvers and Request Box approvers and thus can be reused. Once this is done, when a new Bill is created, you have to select the Approver List to trigger the approval work flow. When ever the setting is disabled – the bills will be treated as automatically approved. To see the approval history of a Bill, click on the ‘Print button’ in actions column to see the approval/rejection history with remarks. Coupled with the fact that you can attach any number of docs with a bill, you can now easily create a Bill – scan the physical copies of the bill and then trigger the workflow. All approvers can see the physical copies of the bill and then approve/remark with their comments. Yet another nifty automation by ApnaComplex to save your time and efforts! Gated communities and Apartments having Metered Utilities (like Piped Gas, Water Meters) face this issue every month when they are ready to raise utility bills on members – capturing of Meter Readings and then raising bills. 1. Maintenance staff go door-to-door to note down the readings in a log book. This itself is usually takes few days based on the size of the community. 2. The readings noted will now have to be digitized and entered into excel and upload or into the portal one by one. This is a place where quite a few issues can crop up with respect to data entry – illegible readings, typos while entering. 4. Now starts the disputes by members – the bill is incorrect, reading is incorrect – largely due to the data entry errors that crept in and more importantly due to lack of validation from concerned members when the meter reading was taken. In ApnaComplex you can address issues like these with the enhanced Metered Utility Billing module (which is part of the Society Accounting Software). We now have Metered Utility App available as a part of ApnaComplex Android Application. 1. Maintenance staff can now move with in the complex / layout with a mobile device (android phone / tablet) when they go door-to-door for collecting the reading. 2. The closing meter reading can be noted against each plot / flat with in the App. The app instantly sends an SMS to the resident confirming the meter reading noted down by the staff. If there is a discrepancy or error the resident an instantly alert the staff or the maintenance office about inaccurate reading. The staff can then re-enter the reading. 3. Once the data collection is done, the society office can validate the data and raise the bills. The meter readings can be overridden if needed by the society office before raising the bills. Less disputes and more peace of mind. The meter reading app works even with out internet! This has the capability to store all the readings locally on the device and push the readings to server when ever internet connectivity is available. This takes care of the cases where internet / GPRS connection may not be easily available across the complex consistently. ApnaComplex is India’s most mature and comprehensive web based society management platform. The platform also include Utility Billing Software for Housing Societies to easily generate bills for the members of the society against their Flats / Villas / Shops for their consumption of water / gas / energy etc. ApnaComplex is designed to make the life of treasurers a lot better by reducing efforts and at the same time bringing in more transparency and accountability in managing finances of a housing society. Check out the features of ApnaComplex and sign up your society today to get the benefits! We offer a free 15-day trial as well so that you can try before you buy! One of the frequent questions that we hear from committee members regarding ApnaComplex is that – “what about members who do not have internet access?”. This especially comes up in the context of Society Billing Software – which helps in emailing invoices / demand notes that are being raised to members. Committee members are concerned about members who are not internet savvy and thus may not get to see a proper invoice in time. Hence committee members want to print the invoices for all those members and drop a paper copy of the invoice in these members’ mail boxes. In ApnaComplex we always had the ability to download all the invoices / demand notes of a billing cycle in a single PDF. Using this, the estate manager can print only invoices of those flats that require a paper invoice. While this solves the problem to a large extent – it becomes very cumbersome for the estate manager to remember the flats that needs paper copy and then to identify them in the PDF file. Interested to know more about ApnaComplex? Visit ApnaComplex.com and sign up for a free 15-day trial. Continuing with the tradition of innovation, ApnaComplex now offers, a first of its kind in any Housing Society Software, a rules engine for housing societies to implement automated billing to members based on any number of conditions. So, what is this rules engine? Rules Engine offers ApnaComplex administrators a mechanism to get list of units (flats / villas) based on criteria conigured by the administrator. Let us say, you want to know list of rented flats where vehicle count is more than 3 and resident count is more than 6. In life with out ApnaComplex you would have to get the data from multiple sources and then try and count manually or write couple of excel macros. Its super easy to get this with the rule engine. Create three rules, combine them to create a rule set, execute the rule set to get the list of flats. That sounds fun. But what is the real utility of this in a Society Accounting Software? Imagine if you were to do billing to members based on a conditions like number of parking lots owned, number of residents in the house, who occupied the flat etc. This data is dynamic and can potentially change every month when you are ready to invoice. It takes enormous amount of time to accurately raise an invoice. With help of rules engine, you can create the conditions that impact your billing as rules, group them as rule sets and save them. When you are ready to invoice, just execute the rule set to get list of flats and then use that to raise the invoices on selected units. Can I use the rules engine with recurring invoices feature of ApnaComplex? Absolutely yes, you can now configure recurring invoices to execute one or more rule sets and then add charges for ONLY those units that meet the conditions mentioned in the rules. Now, that is mighty powerful – the system automatically executes rules that are defined by the admin on a periodic basis and then generate invoices to only those flats that meet the conditions. Zero manual intervention. What if billing criteria in my housing society changes? You can change the conditions and the threshold values for the conditions any time you want. I can’t wait to use it. Where do I find it? If you already using ApnaComplex, go to Income->Member Income. Click Setup Rules to get started. If you want to get started with ApnaComplex, register your society and get started! Is there anything else I can do with the rules engine other than billing? 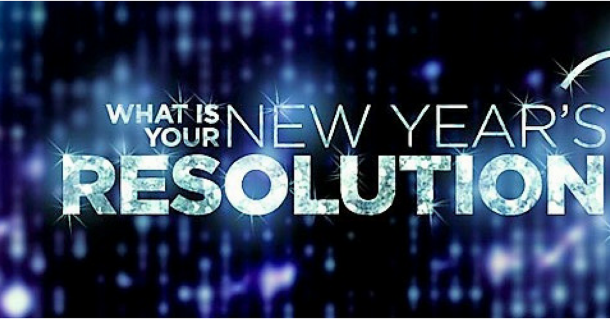 A New Year gift to ApnaComplex Treasurers! ApnaComplex – your favorite Society Accounting Software now supports giving refund to members easily. One of the not-so-frequent scenarios that happen in a housing society is to refund money paid by members. This usually happens when members pay excess amount to the society and later claim refund or when caution deposits made are to be refunded to tenants. In one of the cases we are aware of, a member has paid Rs. 90,000/- instead of Rs. 9,000/- by mistake to the society via NEFT only to claim a refund later. We have been advising our treasurers a series of steps to issue a refund to members. Now, we have automated all these steps and issuing a refund is now as simple as any other financial transaction in ApnaComplex. Just go to Income->Member Income. Filter on flat and select the ‘Add Refund’ icon against the flat to issue refund to members who have advance payment in their accounts. All you need to do is fill the amount of refund, mode of payment etc and you are done! Like with all other scenarios, ApnaComplex takes care of all the accounting entries behind the scenes. You can also view refunds given across the society, against specific flats easily – view the details of the refunds given and even delete refunds given if needed. ApnaComplex released a major enhancement to the accounting package that makes it possible for treasurers and accountants to record head wise advance payments from members. ApnaComplex already has the following capability of recording Advance Payments (a.k.a Excess Payments) from Members: For example, consider a member having dues of Rs. 1800/-, but the member has made payment of Rs. 2000/-. In ApnaComplex you can record the additional Rs. 200/- as an Excess Payment. Now, when a new invoice for Rs. 500/- is raised for club house booking, the Rs. 200/- would automatically get adjusted against the new invoice. 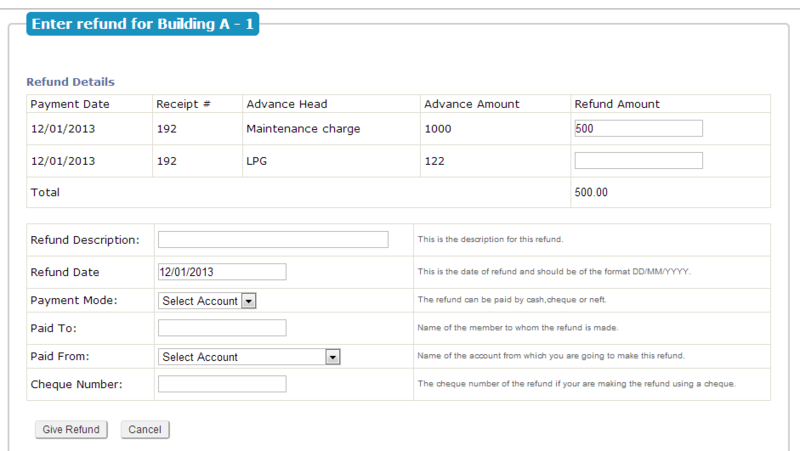 ApnaComplex now supports recording of the excess payment against a particular charge type (a.k.a Income Head). With this ability, advance payments against a given charge type will only get auto-adjusted if there is a new charge/invoice against that particular charge type. In the above example, when recording the excess payment of Rs. 200/- members and admin would have the ability to mention the 200/- to a particular charge type – say against Maintenance Charges. Now, when the next invoice of Rs. 500/- is raised against the flat for Club House Booking – the 200/- that is paid as an advance against Maintenance Charges would NOT get adjusted against the Rs. 500/-. However, when the new invoice for next maintenance charges is raised, the Rs. 200/- would be auto-adjusted. There are quite a few apartments, where the owners pay the maintenance dues and tenants pay for charges like Club House etc. In most cases Owners pay the maintenance dues in advance for 6-months or an year. In such cases any facility booking by tenant or move-in/out charges should not get auto-adjusted with the advances paid and must be maintained separately. With this enhancement, Treasurers and accountants have greater control over the auto-adjustment. Similarly the advance received towards a Corpus Fund will no more auto-adjusted against the Maintenance Due invoices. The default behavior of excess payment will continue to be the earlier way of “Generic Advance Payment” which will auto-adjust the advance with new invoice of any income head. Similarly when the member payments are uploaded via excel, ApnaComplex will put any excess payments into Generic Advance Payment bucket itself, like earlier. Want to ease your (or your Treasurer’s) burden? – Get on to ApnaComplex – Today! ApnaComplex is India’s most comprehensive web based housing society accounting, management and community collaboration software. It is designed to make the life of residents and owners way lot better by bringing in more transparency and accountability in managing a housing society. Check out the features of ApnaComplex and sign up your society today to get the benefits! We offer a Free Edition which you can use free of cost forever. There is also 30-day no-obligation trial for Paid Editions which can try before you buy!